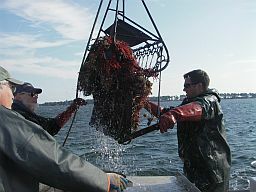 The oyster dredge survey is conducted every fall in collaboration with the Virginia Marine Resources Commission (VMRC). Samples are collected on a subset of public oyster bars in six of the major tributaries of the Virginia portion of the Chesapeake Bay. Bottom samples are collected on each of the oyster bars using a small oyster scrape/dredge. From each sample, the number of market oysters (> 76 mm), small oysters (< 76 mm, excluding spat), spat (recently settled recruits), new boxes (inside of shell clean), old boxes and spat boxes are counted. The resulting data provide qualitative information about spatfall and recruitment, mortality and relative changes in abundance of seed and market-size oysters from one year to the next. For more information and data pertaining to the oyster dredge survey see the annual summary reports.